The Swedish company MEDA (belonging to Mylan (USA) since mid 2016) has the nice “CB12 boost”. 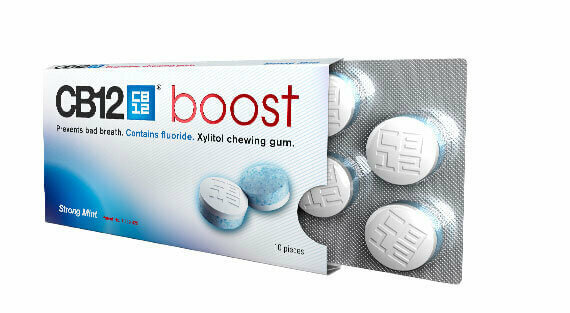 It is designed to fight the bad breath and for this prupose contains Zinc (in form af zinc acetate dihydrate) and sodium fluoride (NaF). The foremr is supposed to reduce the sulphur gases which cause the bad breath, the later is a well recongized agent in the oral care field which contributes to the maintenance of the tooth mineralization. It is also formulated with xylitol, which plays a role in this action. The product is patented (Nr. 1 589 825) by GumLink, the danish company. The CB12 range has also a mouthwash that has the same purpose, so both products complement each other.